We offer full-service AV design, sales, installation, and support for audio video systems and equipment. As the 6th largest audio visual systems integrator in the Nation, CCS can design a custom AV solution to meet the needs of your company, district, church, or school. We specialize in interactive technology, cloud-based conferencing, and high-quality audio-visual products to improve efficiency, increase collaboration, and enhance presentations in your organization. It is our mission to be UNIQUE; offering you visionary yet practical solutions. It is our duty to be KNOWLEDGEABLE; helping you to make the best decision concerning your needs. It is our responsibility to be DEPENDABLE; ensuring you success with daily operations requiring our products and services. Beyond offering state of the art products and services, we create strategic options to meet your unique needs and deliver the optimal communications environment. From system design to installation and product training to service and support programs, we connect our clients with customized end-to-end solutions that are scalable, reliable and, above all, simple to use. "Thanks Robert! The guys did a great job with the install. It looks really nice and they left the place really clean. You'd never know there had been work done. They took a few minutes to walk us through the basics and answered the questions we had. Great team! Kudos to them!! Thank you for the great customer service!" 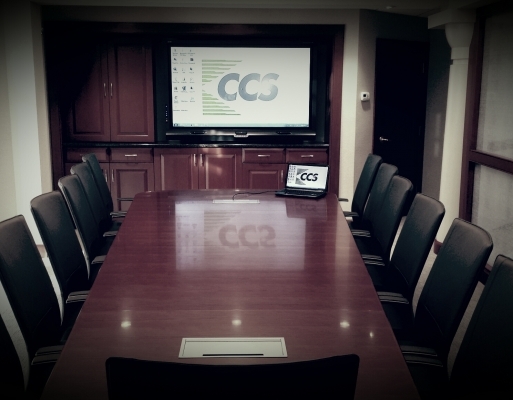 "Regarding CCS New England's Meeting Spaces: 'I have used CCS Presentations for two separate meetings, and found their space to be absolutely top-notch. The diversity of presentation and meeting tools available to me was incredible, and the meeting space itself is incredibly versatile. Whether I'm running a meeting with fewer than 10 people, or one with more than 20, the meeting space and available tools are perfect. And, being able to video-conference with others who are off-site is a huge help to me in my role!'" "Our account rep goes above and beyond to accommodate our school needs. You are our preferred company for all our audio visual needs. We love CCS. Brad and the installation crew do great work for us. They install, test and cleanup in a timely and orderly manner. We feel like we are their most valued customer." "CCS is always professional and willing to meet our needs. The installation team is professional and always communicates a clear process." "When the projector failed, they quickly arranged for a replacement and schedule installation. They are always pleasant and professional, returning to finish the job when they said they would. I’ve worked with a number of other providers who are unable to answer question in a timely way – or ever. You team’s prompt responses to questions and problems keeps me coming back." "Hi Blair, Thank you. The projection images are great. The patience you had with us in the decision making is to be commended. Joel called me and stopped by on his own time to be sure I knew how everything worked. The entire experience shows me you're entire company is about great customer service. Thanks to you, Joel and the Mitsubishi Rep. for exceeding our expectations through products, pricing and service. Thank you from all of us at Bible Baptist Church." "I wanted to tell you and your team that we greatly appreciate all of your hard work. Your team is very effective at troubleshooting and implementing Audio and Visual systems. We really appreciate your team going the extra mile for us." "Dear Everett and Rob, I have been involved in many projects big and small over the years. But I really have to stop and say Kudos. I was so impressed with your technicians and your approach to our Student Center upgrade. They had a complete notebook with the entire specs and requirements I wrote up. They asked any questions they had right up front. They came prepared with every single little thing they needed to do the job, no matter what they ran into. And without asking, they cleaned up the cabling wires, and cleaned the entire area. Wow! They were just so efficient, and professional. I let them know what a great job they did, but you need to know too. Again, many thanks for a job well done." "The following is a quote (with permission) from a customer email praising our work: 'ALL, The overhead projector project has been completed. I want the thank each of you for your many hours of support and encouragement in the equipment selection process, and approving the purchase order of the selected equipment package. CCS, the dealer/installer of the new equipment has done an outstanding job. They went the extra mile in making the cabling and wring as transparent as possible. They even painted the new support poles, brackets and the conduit that carries the electrical wring and connection cables to the third projector the same color as our existing ceiling. As a added bonus, they replaced 5 burned-out ceiling bulbs, removed the studio light gels and adjusted them for optimal video performance, at no additional charge. Brother Lewis Butler and myself were on-location during the two days it took for the installation to assure the install was successful and completed before our Easter's Sunrise Service.'" CCS understands that strong partnerships do so much more than create solid supply chains. The relationships that we have established with our vendors enhance the service capabilities we provide to our customers. Our excellent relationship with our vendors enables us to provide our customers the best-level pricing, priority product allocation, priority technical support, and customized offerings. CCS is one of the top resellers in the U.S. for Epson, Samsung, Extron, Hitachi, Panasonic, Crestron, BIAMP, AMX, JBL, Chief, Da-Lite, and many others.